T'xwelátse is a man. He was turned to stone but he is still alive. He connects us to time immemorial. He is at the heart of the exhibition Man Turned to Stone: T'xwelátse as it was produced at The Reach Gallery Museum Abbotsford in April 2011. 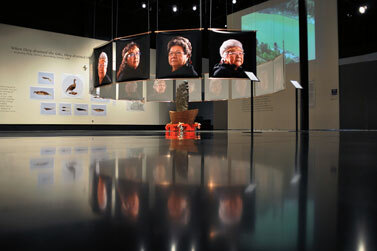 The exhibition told the story of Stone T'xwelátse. It described how he was transformed to become a part of the Stó:lō cultural landscape and explored the history of colonization that led to his being lost for more than one hundred years. 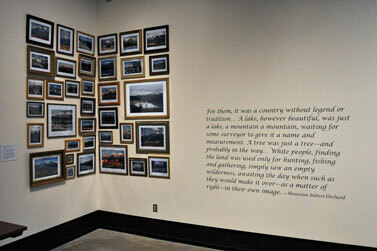 It also documented the cultural revival and complex process of repatriation that brought him home again. Of course, the exhibition had to be taken down at the end of its run. Like the exhibition, this book tells the story of Stone T'xwelátse. T'xwelátse is an ancestor of the Stó:lō who was transformed as a lesson for his descendants about how to live properly. Stone T'xwelátse contains the soul of a transformed man who came from the Ts'elxwéyeqw (Chilliwack) village of Th'ewá:lí (Soowahlie) on the Chilliwack River. The man T'xwelátse was turned to stone by Xexá:ls (the Transformers), who travelled through the land in the distant past making the world right. This was the time of the Sxwōxwiyám, the period of the distant past when the world was mixed up. Stone T'xwelátse forms part of a broader landscape transformed by Xexá:ls. Using the supernatural powers they possessed, Xexá:ls physically transformed people they encountered at particular locations into stones, mountains, and other forms. Xexá:ls transformed the living souls of these people, who ever since have remained embodied in their altered forms, just as T'xwelátse's soul remains alive and embodied in stone. These transformations surround us as the living, ancestral landscape of S'ólh Téméxw—the Stó:lō world. 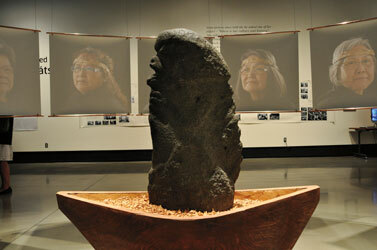 Stone T'xwelátse provides a centrepiece around which we weave together multiple transformation narratives. These narratives derive from the time of Xexá:ls, and they also derive from the most recent era of transformations unleashed in Stó:lō territory by colonization and those whom the Stó:lō call Xwelitem (hungry people), in reference to the newcomers' seemingly insatiable appetite for land and resources. Stone T'xwelátse offers profound access into the cultural heritage of the Stó:lō—from the dramatic events that led to his loss over one hundred years ago to his subsequent recovery by the Stó:lō and the message he has to share with the community at large. That message—We must all learn to live together in a good way—is particularly relevant today as we attempt to bridge divides and unite communities. Reinforcing this message, the exhibition highlights themes of caretaking responsibility and repatriation as well as the theme of transformation that, once recognized, can be viewed all around us. The exhibition, originally curated at The Reach Gallery Museum Abbotsford, helps Stone T'xwelátse carry out his work as a living teaching icon. As a stone man, he cannot do this work alone. He relies on his family, his caretakers, the carriers of his name, and his friends to bring out the messages contained within him. Within his story are teachings and principles that are valuable educational tools for contemporary society. Those of us involved in this exhibition, Stó:lō and Xwelitem alike, were his arms, legs, and voice… helping to express his teachings about Stó:lō ways of understanding the world and bringing them to public attention. Man Turned to Stone: T'xwelátse mixed photography, film, performance, oral and written history, and community collaboration—all surrounding Stone T'xwelátse as the central figure. 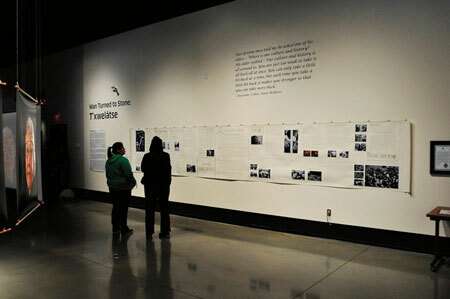 With so many elements, translating the exhibition into a book was a challenge. This challenge parallels that faced by the Stó:lō in maintaining the integrity of the oral narrative while translating knowledge and culture into a form that could/can be understood by their Xwelitem neighbours as they arrived… and arrived… and arrived since the early 1800s, and as they continue to arrive in droves today to settle in S'ólh Téméxw. In carrying out the transformation from exhibition to book, we maintained a principle of "fixation"—of transferring images and text from the exhibition to the book as directly as possible, maintaining the essence, the core, the structures. This was no easy task. It stressed us out at times. Changing structures. Imagine facing the challenge of maintaining the integrity of your laws, culture, and beliefs while confronting a total shift in societal structures. You face shifting languages, symbols, and the meanings of things. You are trying to bridge a divide between two communities. Imagine that stress. Imagine… you are Stó:lō. Imagine the challenge. Convey to the "other" your laws, your way of doing things using only the spoken word and oral history, and do so in a foreign language—English. Is there an English word for shxwelí? No. How about Sxwōxwiyám? Not exactly. How, then, can you convey the richness and depth of these Halq'eméylem words, let alone the worldview from which they arise? Would writing down the words help? Try it. Part of the meaning gets lost in going literary. You are an oral society. You have your own laws, cultural beliefs, and ways of understanding and doing things—all things, both very broadly and in great detail. Could it be that such detail and such a general philosophy simply cannot be translated across the societal and cultural divides that face you? Is it worth trying? The potential for miscommunication is enormous. Yet look around. Communication plays a major role in accounting for losses to the land and resources around you: losses meted out at the hands of "others"—hungry people—often unwittingly. Your lakes are drained. Your heart is drained. Yet you are dealing with human relations. Xwelitem are humans; Stó:lō are humans… sharing this "space." Or is it a "place"? Even differences in meaning between these two simple, one-syllable words are difficult to pin down, yet central to developing respectful understandings and relations with one another. Look them up. These impacts result mostly from a lack of communication. We must fill this divide. We can do so with knowledge. It is therefore necessary to communicate, despite the difficulties. We have to try in order to learn how to do things better—in a good way. That lakes are drained without awareness of the impact on people's hearts is an act of ignorance. Knowledge, awareness, and consideration of such impacts serve, ideally, to enlighten the actions of others. They help avoid such situations; help maintain health and balance; work towards understanding and reconciliation. When such acts continue to be carried out knowingly, they shift from ignorance to active violence that may then be clearly pointed out and described in terms such as "atrocities." People die from cultural stress. Drain a lake and people die. It's no joke. Education, communication, awareness, and respect stand at the heart of influencing these arenas of action. Our goal, in this "exhibition become book," is to raise awareness of the need to live together in a good way. Finding ways to communicate and truly understand one another remains one of our greatest challenges. 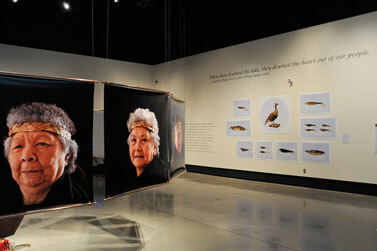 To help address this challenge for six weeks in April and May of 2011, The Reach Museum and Gallery Abbotsford was transformed from a "space" into a "place" of cultural interconnection, social interaction, dialogue, debate, and exploration of issues that define the communities sharing S'ólh Téméxw—the Fraser Valley of southwest British Columbia. For that period of time, the seeds of a cross-fertilized community were nurtured. The aim is that those seeds will grow into a crop of heightened awareness and informed action—in which the integrity of Stó:lō laws, culture, and landscapes is kept intact, is "fixed." Man Turned to Stone: T'xwelátse mixed many voices, integrating (versus assimilating) them in a collaborative way. Collaboration means "working together; sharing." If you have a big ego or want to brand your thoughts, ideas, products, or properties with your one and only name—as personal possessions—then collaboration is not for you. It's a great thing, however, if you want to explore a universe of collective possibilities. It works if you are willing to engage in collective brainstorming, see things in new ways, creatively address issues, and come up with entirely new and entirely shared ideas, products, and properties—collective possessions. Uninterested in the status quo and attracted to invention, those involved in this exhibition ventured into "collaboration." "Institutions" came together. The Reach Gallery Museum Abbotsford, the T'xwelátse family, a photographer/writer duo (the Campion/Shields family), the Stó:lō Research and Resource Management Centre (SRRMC), and the Semoya Dance Company all agreed to work together—each bringing their perspectives and thoughts to the collective table. It was a big table. The Man Turned to Stone: T'xwelátse exhibition wove together stories, narratives, photographs, films, writing, drawing, maps, people, performance, voice, sound, walls, floor, ceiling, space, and, of course, Stone T'xwelátse himself in order to communicate his message. The exhibition went beyond words, including them but adding these other senses and ways of communicating and understanding. As humans, we can learn through all our many points of sensation: our ears, our eyes… even our feet. People were invited in. They walked every which way through the exhibition in a generally circular form. Let your fingers do the walking through this book, beginning and ending as you please, exploring the various elements of this exhibition as they interconnect with one another. The work of photographic artist David Campion is an integral part of this production. His involvement with Stone T'xwelátse began in 2006 when he and his wife, writer Sandra Shields, were invited by T'xwelátse (Herb Joe) to document the repatriation of this Stó:lō ancestor. His portraits of the fifteen Grandmothers, caretakers of Stone T'xwelátse, share the central place—spatially and thematically—of the exhibition. Conscious of his position as a Xwelitem artist, David chose to focus on exploring the transformations unleashed on S'ólh Téméxw by European occupation. In two related works, Semá:th Lake Birds and You See Mount Cheam, Lhílheqey Looks Out Over Her People, he created images that explore the physical and imaginative transformations wrought on the landscape by the shared history of colonization. The film Written in Stone, a part of the exhibition, was directed by David Schaepe and Sonny McHalsie of the Stó:lō Research and Resource Management Centre (in conjunction with Bear Image Productions). This film portrays the landscape of the upriver portion of S'ólh Téméxw (the Central and Upper Fraser Valley through the lower Fraser Canyon), following the path of Xexá:ls as they travelled through the land making the world right. As a Stó:lō-Xwelitem pair who have collaborated on many projects for over a decade, Sonny and Dave approached and resolved questions of "portraiture" and representation of the Stó:lō cultural landscape as a form of Stó:lō Constitution written on the land—representing the words of Xwelixweltel (Steven Point, currently His Honour, the Lieutenant Governor of British Columbia) of the Skowkale First Nation. Also provided through the SRRMC were the repatriation reports T'ixelasta Repatriation Report, Part I and Part II, and the documentary film T'xwelátse Is Finally Home (Joe, Schaepe, McHalsie, Pederson, and Bear Image Productions, 2006), from which quotes were extracted for the section "Voices of Repatriation." The story of the repatriation of Stone T'xwelátse was shared in an installation that brought together handwritten words, documen­tary photos, the official repatriation report, and the spoken words of family, community, and museum staff. 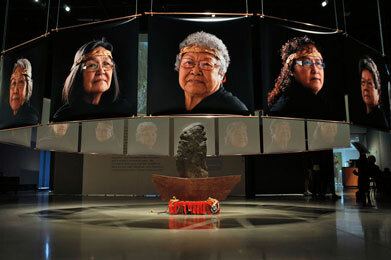 Writer Sandra Shields collaborated with her husband David Campion to produce Storyboard for a Repatriation, an integrated artwork installed as a scroll over twenty feet long that tells the sqwelqwel (personal history; true news) of the loss and return of Stone T'xwelátse. Storyboard anchored the "Repatriation Station" in the exhibition, appearing alongside a desk upon which sat the repatriation report and a computer playing the film T'xwelátse Is Finally Home. In creating Storyboard, Sandra and David faced challenges personifying the teaching that "we have to learn to live together in a good way" at the most basic level of family relations, that of husband and wife—the core relationship for which T'xwelátse was, himself, turned to stone. Sandra addresses this in her narrative in the centre panel of Storyboard. The Semoya Dance Company (Maxine Prevost, Darwin and Francine Douglas), a Stó:lō performance group, produced and launched their world premiere of The Sxwōxwiyám of T'xwelátse as a performance artwork for the exhibition. For their production they designed and made the costumes and regalia, some of which were created from local materials collected from the land around us. They effectively faced and overcame the challenge of transforming these sxwōxwiyám from a literary form, actively re-incorporating these sxwōxwiyám within a Stó:lō context of orality and theatrical storytelling. The written versions of the sxwōxwiyám included in the exhibition and in this book all originate from tellings by Stó:lō community members (George Chehalis, Herb Joe, Amy Cooper) to Xwelitem (Franz Boaz, David Schaepe, Oliver Wells). These tellings are recorded and transcribed. Although this may serve a practical purpose and be well intended, the literary process is limiting, separating and isolating the words, alone, as only one piece of the full set of things involved in the "telling." The transcript, the literary version, is less than the whole of the sxwōxwiyám. Literary and oral forms are not equal in this way. Laws and ways of one are not accommodated by the other, hence both forms must be recognized and respected as distinct systems of communicating and recording things so as not to impact their integrity. The actors in this performance, mostly youth, all Stó:lō, not only recode but decolonize and reconstitute these sxwōxwiyám through their actions / acting. As Stone T'xwelátse was returned to the Stó:lō after a century of separation, the Semoya Dance Company brings holism back to the sxwōxwiyám of T'xwelátse. Now, better understanding the difference, how could we avoid impacting the narrative as an element of the exhibition? We made a film of the premier performance—providing sight, sound, action, voice. This film was projected onto one of the walls of the gallery for the duration of the show. Semoya's voices actively filled the space. The role of The Reach in the process of meaning-making entails understanding the gallery as a site to create contact zones where different identities, people, and artworks can discover new possibilities to develop a cultural remapping, to rewrite cultural borders, and to create experiments in visual art, history, and community collaboration.… The exhibition Man Turned to Stone: T'xwelátse offered an opportunity for people to explore their own identities in relation to others, to reflect on how people are different and how they are the same. 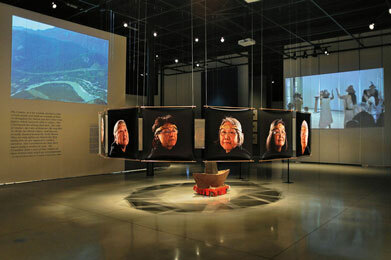 The T'xwelátse family and T'xwelátse (Herb Joe) provided the foundation upon which this exhibition was built, from which societal transformation can occur, recognizing the need for cross-cultural education. 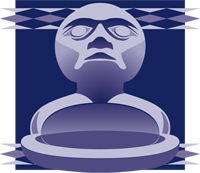 They put their trust in a collaborative process including Stó:lō, Xwelitem, and a Xwelitem institution to do this work—as a microcosmic cross-section of the social landscape of S'ólh Téméxw /southwestern British Columbia—under the guidance and watchful eye of the Grandmothers, of course. To share the experience of Man Turned to Stone: T'xwelátse as fully as possible, visit the interactive version of the exhibition at Man Turned To Stone: Txwelatse.